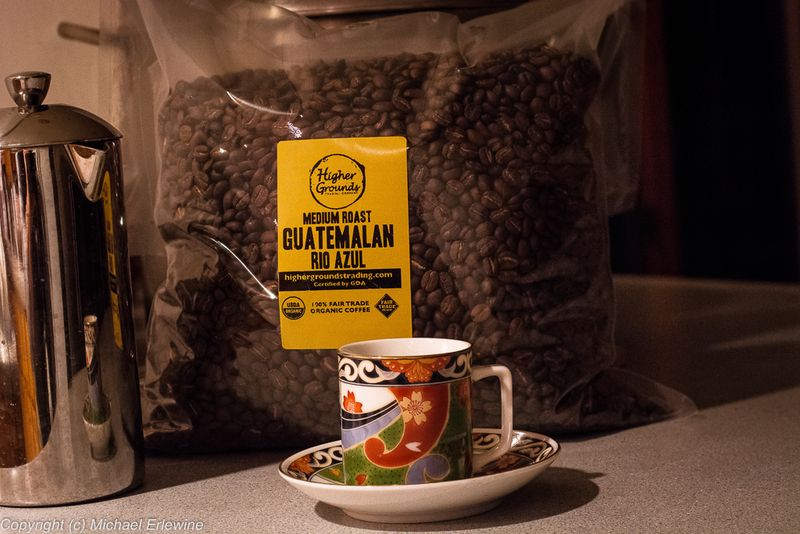 What you are looking at here is a very large (and deep) bag of freshly roasted coffee beans from our friends at Higher Grounds (fair-trade) Coffee in Traverse City. I don't know how many pounds this is, but it is enough. Enough for what you might ask? It is enough for the recording session starting today at our studio (Heart Center Studios) here in Big Rapids, Michigan, for a new solo album by my daughter May Erlewine, with her husband Seth Bernard on guitar, Josh Davis on keyboards (and who knows what else), Dominic John (bass player for Jack White) on bass, jazz-drummer Mike Shimmin on drums, and I am sure a few others. Ian Gorman will engineer it. A few of us will get to drop by and take a listen if we are quiet. We started getting ready for this a few days ago and the session will go on until next Wednesday, thus all the coffee beans. There will be some serious coffee drinking taking place because these kinds of recording sessions can go on until late at night. Unfortunately for me, I will be drinking no coffee, although I am free to breathe in the smell of it that will be all around me. It is not that I don't love coffee; I do. I even have a couple of very nice Italian espresso makers around the house somewhere, one of which I bring out on special occasions, but I no longer allow myself to imbibe. For one, I found out years ago that even if I drink decaf, I won't sleep a wink. And the real stuff will keep me awake for a day or two in a state of trancelike buzz, for sure. So, although I love the smell, taste, and zip that coffee brings, I had to give it up many years ago. And there is an even more interesting reason I don't partake anymore, and that is creativity. I am speaking here only for me; your mileage may differ. I find that caffeine in about any form gets a buzz on. I definitely get a lot more done on a couple of cups of java a day, but I discovered a problem with that some years ago. Caffeine in my body is like white noise on a stereo; it fills the bandwidth of my mind with meaningless static. And you can be sure that I checked this out, not just a few times, but for some years. When it comes to giving up something I am addicted to, I am very scientific. I write a lot, as you already know. As I became more aware of my own internal system, I found that although I wrote a lot more on coffee, the next day upon re-reading what I wrote, it was flat – not very creative in my understanding of that word. Well, I didn't like that, so I began to write without coffee in my veins and I found I was much more spontaneous, and that those little bubbles of creativity from deep down inside me more easily came to my awareness and presented the best of me. As mentioned, I tried this over and over again. Somehow, although coffee definitely speeds me up, it is more smoke and not a lot of fire. As mentioned, it definitely gets the buzz on, but that buzz, like white-noise on the radio, just obscures the more creative parts of me from registering the fine points. I used to think that because when I had coffee I wrote a lot, that this was good. But I found out that although the quantity was great, the quality was not so great. It was missing something, something important, like that little edge of creativity that makes things interesting to me. This was an unwelcome discovery. In the long run, I valued the creativity more than the coffee experience and found myself giving it up, although I have fond memories of the caffeine in my life. So there you have it. There will be coffee all around me, but not a drop I can drink without giving up something even more important to me, and that is some creativity. I prefer the mind without alteration.